Picking the right tires is one of the most important things for a cyclist. There isn’t one right tire for every single one of us. After all, we all have different bicycles, we ride differently and on different surfaces. This is even more true when it comes to winter tires. 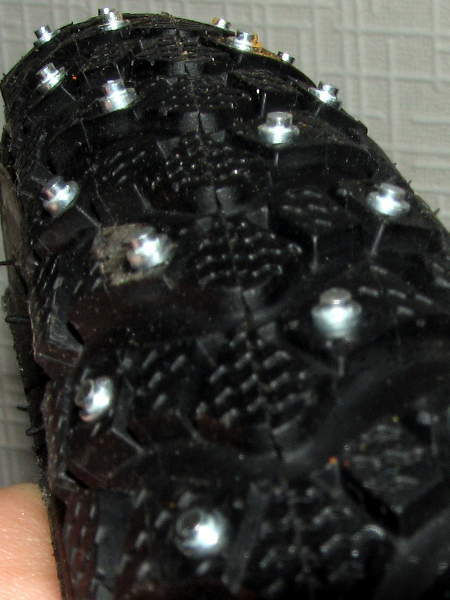 I hope this review will help you find out if Schwalbe’s Marathon Winter studded tire is the right one for your needs. 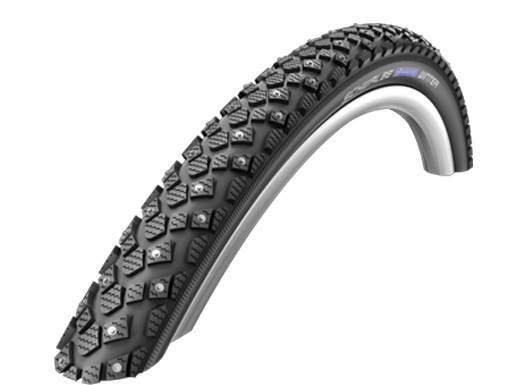 Schwalbe Marathon Winter HS 396: Is it a good solution for you? Let’s find out! 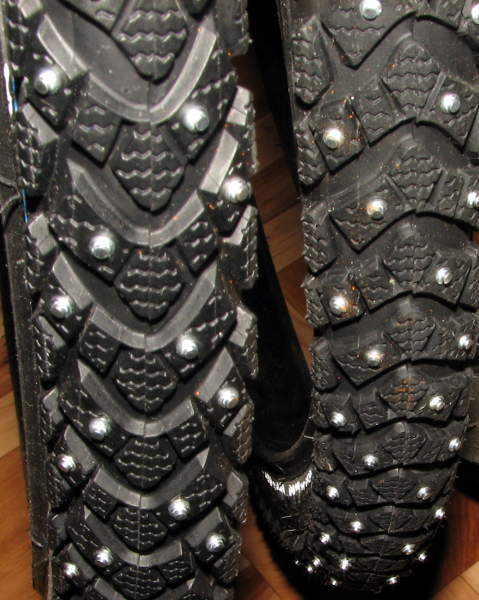 Deep snow and slush: These tires are not for deep snow and slush, but they’re okay for short distances. However, if you constantly ride on snow and no ice, you’ll spend all your energy focusing on staying upright. You’d be better off getting wide knobby tires. Heavy: Well, they do have studs in them! Ice and packed snow: They’re exceptionally stable. Traction is excellent, but you should still take it easy when turning or braking, just to be safe. Sometimes when turning, I feel the bike sliding just a little bit just before the studs “kick in”. Versatile: On my version of the tires, which is 700x35C, the tires can be inflated to 35 – 85 psi. Higher pressure is perfect for riding on bare asphalt, because the studs barely touch the road, except when turning. So you get lower rolling resistance and less noise. Lower pressure is ideal for ice and snow, or snow on ice! Quality and price: Marathon Winter has puncture protection with hard wearing tungsten carbide studs. If you break them in properly (read about this below), they’ll last you for thousands of miles. They’re not too pricey either. Are the Marathon Winter HS 396 tires for you? For urban cycling, the Marathon Winter tires are fantastic, and I can’t recommend them enough! Usually the roads are clear of snow in the cities, with some nasty ice patches. If there’s black ice, then you’ll be one of the few who won’t be sliding all over the place (pedestrians and cars will be. I’ve seen it!). They’re ideal for commuters, and urban cyclists in general. If you often ride in deep snow (4″/10 cm or more), then they are not for you. 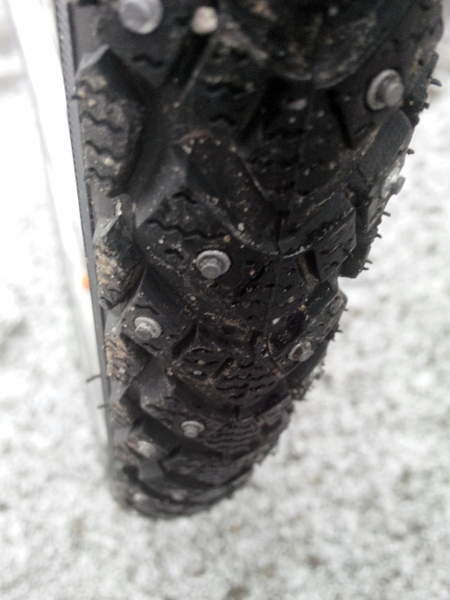 In such cases I recommend the more expensive Nokian Extreme tires, which are perfect for off-road, but are a little too much for urban cycling. Higher pressure insures less rolling resistance when riding on bare asphalt. Drop the pressure if the weather gets worse: more contact surface = better traction. Check the Schwalbe Marathon Winter prices on Amazon, Amazon UK, Chain Reaction Cycles and Wiggle. FYI: To break the tires in, you’ll have to ride 25 miles (40 km) on asphalt. A lower tire pressure is recommended, to ensure that the outer rows of studs are making contact with the road. This will help get all the studs permanently fixed. Don’t ride and brake aggressively when breaking the tires in, and avoid any potholes.